there is a way out. For those of you who have money to design a maggot pen, maggot pen is designed like snail pen in the sense that they all are surrounded with pond. For snail, it is done so that ants cannot come and consume them. But in the case of maggots, it is designed so that maggots cannot escape like that, when it tries to escape the fishes will definitely feed on it, thereby indirectly serving the purpose of its production. The maggot pen is not covered like the snail pen because provision is being made for the flies to defecate on the pig dung or poultry droppings used for the production. That is to say that the maggot building does not have walls it only has pillars. and the pens inside the building is not covered. The height of maggot pen is 15cm; this is to make harvesting very easy. Allowance is always provided in-between the pens so that when the maggots escape the will fall into the provided allowance. The provided allowance surrounds the pen and is always neat, so that maggots can easily be gathered from there, should any fall inside the provided allowance. After you must have designed your pen, the next thing is for you to start the production process. Get your pig dung or poultry droppings, pig dung is preferred to poultry droppings in the sense that pig dung attracts more flies. Get your spent grain,this spent grain is got from Nigerian breweries; it is a waste product from barley,or you can use rice chaff or millet chaff or any crop chaff that is very light in weight. Get your water whether dirty or clean and your shovel and match towards your maggot pen. Mix the pig dung or poultry dropping with the spent grain or chaff. NOTE: Make sure that the spent grain or chaff is wet before mixing, we use wet spent grain or chaff during production and the dry one during harvesting. Pour the mixture of pig dung or poultry dropping and wet spent grain or chaff into the maggot pen; up to 6cm and spread so that it covers the base of the pen. Pour little quantity of water to the wet mixture in the pen. If there are thousands of pen, fill all the pen with the mixture and pour little water into the mixture. Now the question is how to harvest maggots. Harvesting of maggots is made easy if this whole process is followed orderly. First of all spray gradually the dry spent grain or chaff,this serves as separation technique between the maggots and the pig dung or poultry dropping. 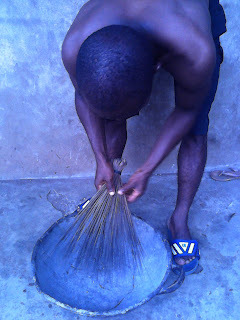 Use the broom to gradually remove the top covers,in so doing, the maggots will always run to the bottom and settle there. As they are running down to the bottom keep on removing the top cover until the top cover is totally removed, remaining only the maggots inside the pen. Use the waste Parker to gather the maggots and move to the next pen. After harvesting then use it to feed the fish and fry the rest so as to preserve it, and to be used to produce poultry feed. The question is "how much do you have" but if you don't have money and you have land then you must go into maize production. maize production is the fastest means of raising money. Just cultivate hybrid maize in two months you will sell and make your thousands.But if you have money at hand then I will urge you to go into poultry first before you can expand your farm. If you have any question you can ask, I will be here to help you. Please, how and where can I get high breed corn? I live in Lagos. please how do we preserve the maggots? can you feed fish and chicken with the preserved maggots or it has to be preserved first? please, can I get video clip on this maggot production?